Jump to the recipe to make Amish Friendship Bread starter. Jump to the recipe to make Amish Friendship Bread. Jump to the recipe to make the cinnamon-sugar dusting mixture. We have free printable 10-Day instructions, labels and gift tags — choose your favorite style here. Want our quickest and easiest Amish Friendship Bread recipes all in one place? Check out our e-cookbook bundle! Amish Friendship Bread operates on a similar principle as a chain letter–pass it on–but with no threats or negative repercussions if you choose not to make it. At the end of the ten days, you divide it into four portions, bake with one, and give the other three away. This usually hums along nicely for the first cycle or two, but eventually people will start running in the other direction if you keep showing up on their doorstep with a fresh batch of starter. You have been warned. >> Ready to bake? 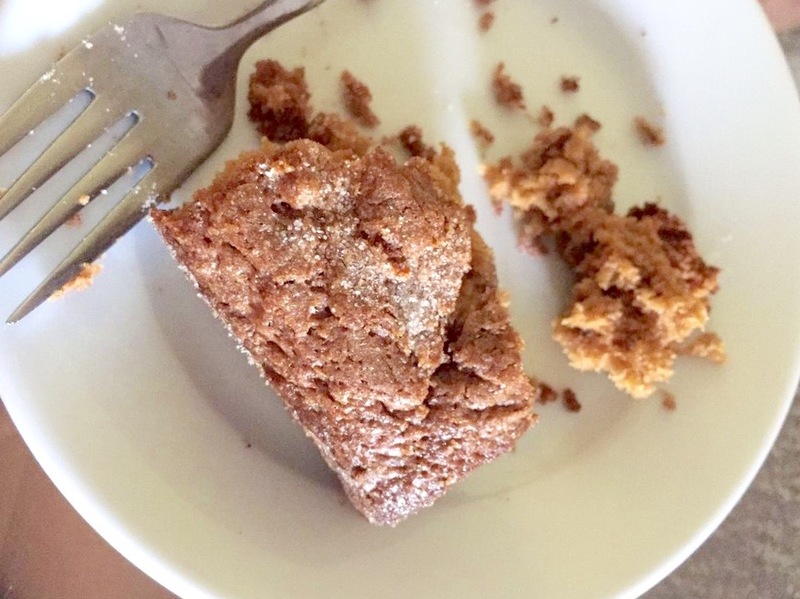 Grab the recipe for Amish Friendship Bread here or read on below to learn about about your Amish Friendship Bread starter. The starter is essentially a sourdough starter with a lactobacillus culture. Because there’s so much sugar in most Amish Friendship Bread recipes, the result is sweet, slightly tangy twist. Like most sourdough starters, Amish Friendship Bread can literally be passed around indefinitely; in fact, the longer it has been around, the better. If you ask around, chances are you’ll find somebody you know with an Amish Friendship Bread starter to share (exercise good judgment if accepting a starter from someone you do not know). Shared starters are always my favorite because the flavor is unique to the people who’ve added a bit of their kitchen to yours. I was gifted one from 1987 and it’s one of my favorites. As long as you continue to feed your starter, it can stay at room temperature indefinitely. One of the wonderful things about the starter is that you can bake almost anything with it. >> Did you know you can freeze your starter if you need to take a break? Learn more about that here. >> Need to make a starter? It’s easy! Get the recipe here. In our Recipe Box you’ll find recipes and variations of those recipes and variations of those variations. 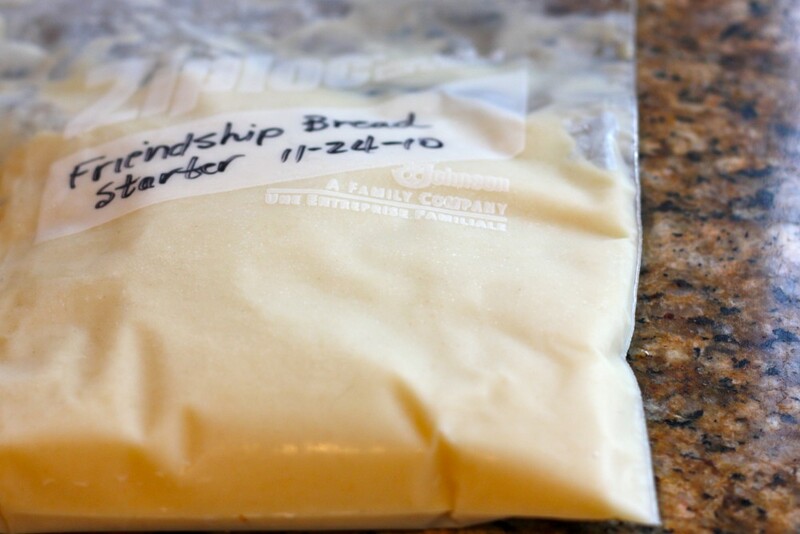 You’ll be amazed by what you can do with one cup of Amish Friendship Bread starter. Amish Friendship Bread is all about friendships and community. It’s about connection. It’s about fun. It’s about nurturing other people, including yourself. It’s about not taking anything too seriously, but to find the simple joy and pleasure in every moment. Following are the recipe and instructions for Amish Friendship Bread as it was given to me. You can also view a selection of different instruction styles (including large print!) by clicking here. Add 1 1/2 cup flour, 1 1/2 cup sugar, 1 1/2 cup milk. Mix well. Measure out equal portions of 1 cup each into 4 1-gallon Ziploc bags. Some people will end up with 4-7 portions depending on how active your starter has been, especially if you made your starter from scratch. Keep one of the bags for yourself (or leave it in the mixing bowl if you plan to bake right away), and give the other bags to friends along with the recipe. Your journey has officially begun! We have lots of Amish Friendship Bread recipes and photos to inspire you, and if you find yourself stuck or needing an answer to a question, visit our FAQs or post your question on our Facebook wall. You can even submit an Amish Friendship Bread recipe if you have one you’d like to share! Support the Kitchen by picking up a copy of our e-cookbook, Quick and Easy Amish Friendship Bread Recipes, and you’ll have everything you need to bake Amish Friendship Bread whenever you want. Most recipes will yield two loaves, one for you and one to share. Keep the spirit of Amish Friendship Bread alive by sharing what you have with others — put a smile on someone’s face today by baking them a loaf of Amish Friendship Bread. Thanks for being in the Kitchen with me!